At least four people are believed to have died and many others injured in a stampede at a game in Honduras. The incident occurred at a sold-out match between Motagua and Honduras Progreso in the Honduran capital. News agency Associated Press reports that a police statement claimed too many tickets had been sold. Motagua denied too many tickets were sold and said they warned "responsible authorities immediately that fake tickets were being circulated". 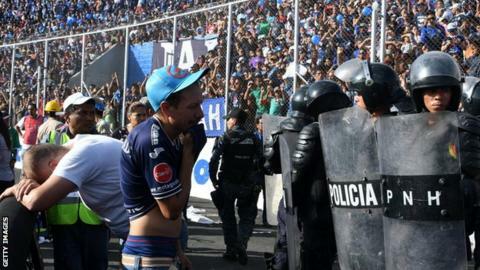 They said the fake tickets "enabled people to enter the stadium illegally to watch the final between Motagua and El Progreso - people who apparently occupied seats that were not theirs, forcing others to leave the area". The game went ahead, with Motagua winning the title play-off match, held at the 35,000-capacity national stadium in Tegucigalpa, 3-0 on the day and 7-1 on aggregate. In a statement, Motagua expressed "its deepest condolences to the family and friends of the four people who sadly died in the accident at the start of the final" and wished "a speedy recovery to those injured". However, they added: "It is important to bear in mind that all the ticket sales are supervised, and in this case approved, by the national commission for sports facilities (Conapid), which is an agency of the Honduras government. "The club is helping in the investigation into what happened at the stadium, which was under police control - according to the rules - as always 48 hours before any sports event."